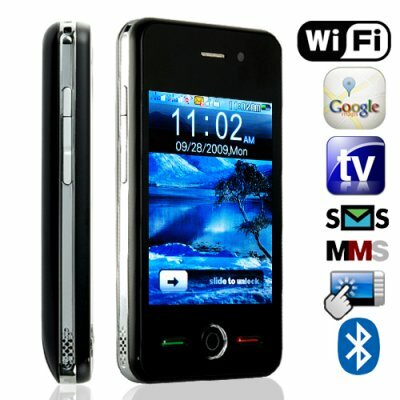 Successfully Added Thunder - Quadband Dual SIM Wifi Touchscreen Worldphone to your Shopping Cart. Finally a phone that performs as well as it looks! If your worried that this phone is all looks and no brains, then think again! The Thunder incorporates the best in mobile technology, bringing you convenient features such as Wi-Fi internet access, two SIM card slots with dual standby, handsfree communication, Google maps, Quad band GSM connectivity, and much much more. The is really one of those phones that makes you feel good to be alive! Aside from quality and style, everyday usability and convenience is what the Thunder is all about! The menu system is easy to navigate and the large responsive touch screen is a real pleasure to operate. With support for all four global standard GSM frequencies (850MHz, 900MHz, 1800MHz, 1900MHz) you can use this phone anywhere in the world and remain totally confident that it will always be able to connect. This phone also comes fully unlocked, relieving you of the need to sign any contacts or be obligated to any one service provider, because you are free to do as you like! Also heading the list of convenient features is the dual SIM card slots with dual standby mode. This means you will never miss an important business or personal call again thanks to the two active phone numbers stored inside one individual mobile phone! With the Thunder, accessing high speed wireless internet from your mobile phone has never been easier. With the simple touch of a button you can scan for and connect to any wireless modem or hotspot and be surfing the web in just seconds! Fully supporting its Wi-Fi capabilities, the Thunder also comes with the best in online mobile software. Never lose your direction again with Google maps, or chat with your online friends from Facebook, Yahoo, MSN, AIM, ICQ and Google with the powerful eBuddy application. Conveniently browse the internet or access your email with the popular Opera mini web browser. This phone truly provides you with everything you need to have the most satisfying online experience possible! When you first look at the phone you will instantly notice the high quality 3 inch touch screen that covers most of the phones surface. The HQVGA screen sits flush into the phone's body so you get a smooth edge to edge feel when handling the phone. In addition, the super cool slide motion sensor allows you to effortlessly navigate the menu system with the simple slide of a finger. Adding even more to the equation is the accelerometer, a feature that is as useful as it is amazing. With the simple shake of a wrist you can change songs, TV channels, wallpaper, FM channels, and you can even change the view of a video by turning the phone sideways and the screen automatically adjusts from portrait to landscape view! When its comes to media features the Thunder makes no compromises. With this Bluetooth enabled mobile phone you have the option of using a convenient hands free earpiece or Bluetooth enabled audio system for making and receiving phone calls. You also have the ability to play your favorite MP3 files though your Bluetooth ready car sound system. If you enjoy using your phone as a portable multimedia device then this phone is for you. The Thunder allows you to playback all your favorite MP3 and MP4 files from a removable Micro SD card (2 GB TF card included free! ), you can even watch analog TV as well as listen to FM radio stations. This phone also allows you to record high quality videos and take beautiful pictures with its built in cameras. Entertainment convenience in one pocket sized device! Features and looks aside, the Thunder is an overall great performer. Call quality is loud and clear, the menu system is fast and responsive, and the build quality is solid and robust. A simple yet powerful phone that will keep you satisfied for years to come, and at a great wholesale price, you can't go wrong. The Thunder is in stock in our warehouse and ready to ship out now. Place your single piece or bulk order today and we will express ship it out the next business day! Proudly presented to you by the leader in Wholesale electronics, Chinavasion! On Board Applications: eBuddy, Google Maps, Opera, And more..
on 2011-01-15 12:05:14 I love this phone!!! really nice phone. I recieved the phone in just 5 days (Thailand). And all functions is really good. I love the phone and deliver goods service, it really good. the only one problem for me is it doesn't support Thai so I can't read my thsi sms. I'm very happy. Arrived in Italy just in 4 working days (incredible)! Great Phone and really good price. What more ? Thanks to Chinavision ! on 2011-01-04 00:28:39 Thanks to Chinavasion!!! Great product, excellent quality and quick delivery I am very pleased, thank Chinavasion!